Khan, who will be based at the Wild Card Gym, Hollywood, LA, for the next six weeks, will undergo his third camp with Freddie Roach, fresh from masterminding Manny Pacquiao's victory over Ricky Hatton in Las Vegas 10 days ago. Khan insisted that he is prepared "to go through hell" to get to the shape he needs to be in. "It's always tough with Freddie in charge, but I've been going through the wringer for the last week or so," said Khan. "And Freddie has told me that things are going to get much worse before they are going to get better. "The runs I have to go on and the physical work that I do are agony - and that's before the sparring starts! "I've heard that Freddie has got some very tough sparring lined up for me, but it's just a case of bring it on. 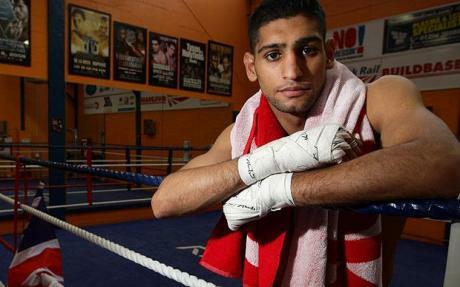 However, Khan will not be sparring with Manny Pacquiao ahead of his world title bid at 140lbs. "I don't think I'll be working with Manny Pacquiao like my last two fights, but there are still lots of quality fighters in the gym, and whoever I face won't be holding back. "I've never felt this good before a fight, and I've still got a month and a half to go. People are going to see a really explosive performance from me against Kotelnik." Khan insisted the Wild Card Gym camp is abuzz after Pacquiao's stunning victory over Hatton - even though he had split loyalties during the fight. "I was definitely a neutral when it came to the fight because Ricky was one of my boxing heroes and I've obviously worked with Manny," said 22-year-old Khan. "But the result has given everyone in the gym a real boost, and made me want to go out there and get a win against Kotelnik. Having seen what Manny did, I want KO victory as well. It increases the pressure on me a bit, but then I've always thrived under pressure, and people are going to see that on June 27."